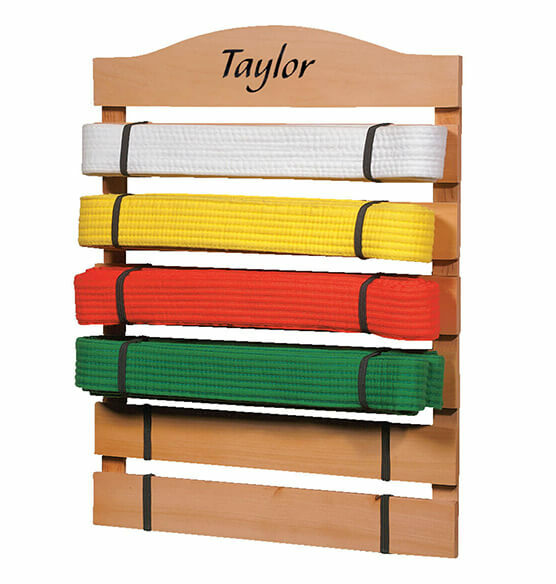 The perfect gear for your “karate kid.” Personalized karate belt rack holds up to six folded belts. Elastic holds them in place. 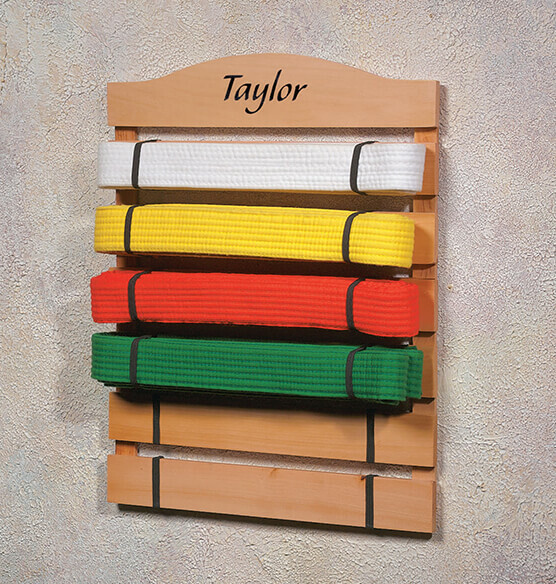 Personalized karate belt display features child's name in black. Please specify; limit 1 line, 10 letters/spaces. Clear-finished wooden rack is 14" x 17 3/4". Hooks on back. I bought 2 - one for my daughter & one for my niece bc it was such a great deal. Their TKD school sells similar belt racks for 5 times more and they aren't even personalized! This belt rack is professional, affordable, personalized, and is the perfect size for her room. I do wish there was an option to add more belts/wood tho bc she's almost got this one filled! Plan on giving it to my grandson for Christmas. THIS BELT RACK IS FOR MY GRANDSON WHO HAS BEEN TAKING KARATE LESSONS FOR A FEW YEARS. HE CAN HANG IT IN HIS ROOM AND HAVE HIS DIFFERENT COLORED BELTS FOR ALL TO SEE. IT IS ALSO PERSONALIZED WHICH IS A NICE FEATURE. THE QUALITY IS VERY NICE. I KNOW HE IS GOING TO LOVE IT! Bought this belt rack three times already. This has been a Christmas gift for my friend's son for the last three years and he loves them. He asks for one every year. The personalization is a nice touch. Extremely pleased with this belt holder. Very sturdy and well made. The name is printed on and is very professional looking. Love this! I bought 2 of these for 2 of my grandchildren. They have started Tae Kwon Do, and this is a great way to keep their belts organized and to display their belts as they earn the next belt. It shows their progress and accomplishments to keep them working hard to advance to the next level. This is a gift for my son. He is working his way to a black belt and we have about 10 belts with no place to go so this will be prefect for him to display is karate belts. It's so nice. I bought it twice. It looked professional. The personalized name was in a beautiful script. I have purchased 3 but 1 came. Broken. This gift was suggested by my daughter-in-law for my granddaughter, who is into Karati and now has achieved several belts. I bought two racks as each hold only 6 belts and she will probably attain a lot more. Nice gift idea that a lot of folks wouldn't think about. My granddaughter loves this. I purchased the bag too, and she uses it to store her uniform between classes so she knows where everything is. She is 6 and just loves both items, we will need to buy another rack soon for her, and when her 2 year old brother starts, he will need them too. I can't wait to need to purchase more. my grandson is proud to show off his karate belts. He already had 4 belts when I bought this. I wish there was a board with at least 10 spots for belts. I purchased this for my god-son. It is definitely a nice way for him to display his belts. The personalized name on the top looked nice. Unfortunately, the rack arrived broken. The top board (with the name on it) had detached (during shipping?). We were able to easily fix it, but for the price, having to rebuild part of the rack ourselves was a little disappointing. Hopefully a fluke. Its sufficient for our needs. This rack was lighter than one we already had, but works for our needs. It was approx half the price, so that's good. I totally agree with the other mom who said this holder was just as nice as holders that are sold through karate catalogs for way more money. I actually ordered one through the karate school for $40 and sent it back when a friend got hers through Miles Kimball.[... ]The only problem I see is that it needs to have more slots for those kids who have more than 6 belts, but I just ordered 2! Other than that it was a great deal and a very nice product!! i bought three for my girls. I love them all they are very nice and great to be personalized. the only problem which was minor was the black straps are very tight and i pulled way to hard on first one and broke it but sinchy to fix so just dont be a brute like me and you will be fine. I would suggest to anyone, great item!! This is such a great idea to display the progress my son has made at karate. My only issue is that between a 4 month period I placed 2 orders and the font came back different than the first one. my son practices karate and this is the perfect way to display his progress in moving up the belt ranks. Very nice to display belts. Good for anyone. lessons for a little over a year and loves it! show his accomplishments, that is until now!!!!!!!! I'll need to buy a second belt rack! Great price on the belt racks. Displays well. Nice gift for someone into martial arts. Hold the belts securely. Nice gift. Got one for my grandson and one for granddaughter. They loved them! The display is very nice & I think my nephew will enjoy it. Unfortunately, it does not have any hanging hardware or even a notch for hanging. I hope the wood doesn't split when we try to modify it. These karate belt holders were ordered for my grandsons. I liked the idea of personalizing with their names. Both arrived with top wood slat disconnected. We had to repair and determine if that will hold. There were tiny staples holding this wood slat on- and both were disconnected upon delivery. We hope the gorilla glue will hold. The boards are stapled together, it came with the main board that you hang it from totally separated from the rest of the rack, the staples bent. Pretty sure we can fix it, just should have been inspected better before shipping. If you're looking for a nice display for martial arts belt this will suffice. Adult belts are longer and thicker so may be too big. The rack is stapled together and packed badly, we nailed two back together and it was fine. We had names added to all five so didn't want to return.Placement of hanging loops should be in different spot so you can hang with smaller nail. Overall good rack to hold belts. I just wished it held more than 6 belts. Advertisement shows bag and belt rack together with one price. However we only received the belt rack. After calling to inquire they said they were being sold seperate. I was so disappointed to see how poorly made this product is. The slats are detached. Using staples that don't even reach the slat certainly will not keep it in place. There was more than one slat. I wanted my son to fix it rather than go through the exchange process but I would not order this again. At least the monogram was nice. It needs more spaces for belts (if your child wants to earn up to black belt). My 10 year old grandson received his fourth belt in Karate recently. Needed a display rack. When we unpacked rack the top hanging slat was detached, two insignificant staples came out. I reinstalled with glue and screws. When grandson tried to install the belts the elastic bands were too tight and another slat came off. Very unhappy, particularly as cost of unit was so high. My Grandson is taking Karate lessons this will inspire him. I want my junior judoka to feel good about his accomplishments that he earned. For my sons birthday he wanted something to display his belts.